We’ve revised the A4 print format of your AgriDigital documents, reflecting the level of professionalism, clarity and technical accuracy the electronic documentsprovidewithin the platform. Page spacing to reflect electronic copies, with improved logo and heading alignment. 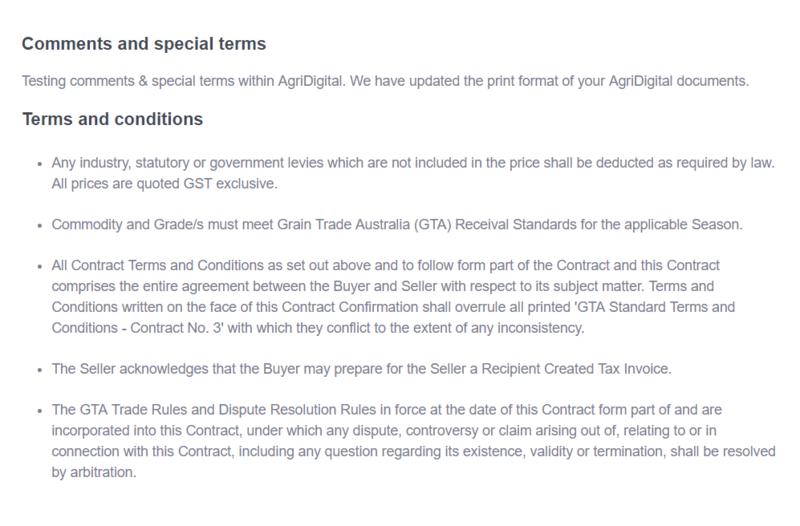 “Additional terms and conditions” section on Contracts has a new and improved format with the two headings “Comment and special terms” and “Term and conditions”. A4 print version of all documents have consistent colours, font, spacing, and sectioning. At AgriDigital we appreciate your feedback as we strive to provide you with the best possible tool for your business, please contact us at support@agridigital.io if you have any questions or comments.